Tank woo fur making me one of your it's! I'll do that one 'soon'! Nice pikh and tank woo fur identifying the subjekht matter! I am wondering how you all managed to nearly get in the photo in the first place. Well done to your human for her attempt. It's an "almost" getting everyone in! Great shot! Our mom has to bribe us with cookies or snow to get all of us in a picture! Thanks for the tag Unkey Tubey... we will get right on this game! 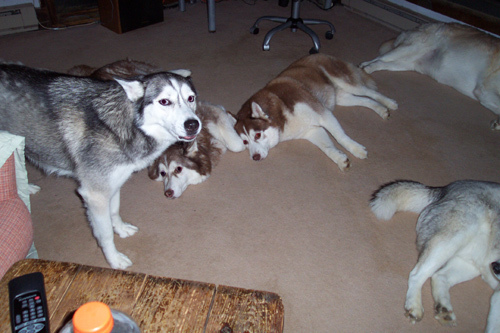 We tell our humans that need a wide angle lens to get a picture of all of us sprawled out in the den, so we understand! Our Mom has lots of pictures like that too! she tries but not successful most of the time! But you certainly look happy! That's a great picture...even if we can't see all of all of you! Merry Christmas to you and your hoomans! hey hey tubey! i liked your pickture... it just looks so homey and lovey and everydog togethery. WOO Tubey - that was pretty good! The pic showed all of what mattered, right? We love the expression on Rooie's face.